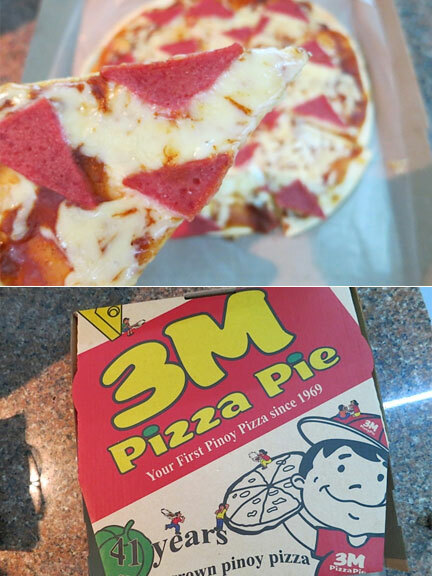 According to their website, 3M Pizza started in Cubao in 1969. The owner, upon arriving from the United States, felt that the market at that time did not have a place where consumers could take-out pizzas cheaply and quickly. She then tweaked the sauce to suit the sweetish “Filipino Taste”; Thus 3M Pizza was born. My first experience with 3M growing up was when my parents bought a membership to the then new Green Valley Country Club in Pasig. My sister and I would go swimming and since there was a 3M Pizza kiosk beside the pool, it would always be our after-swimming merienda by default. At that time, there was only one flavor (Ham and Cheese) available, and we would finish a pizza between the both of us. We enjoyed the crispy dough, the sweetish, slightly piquant tomato sauce and the melted cheese. 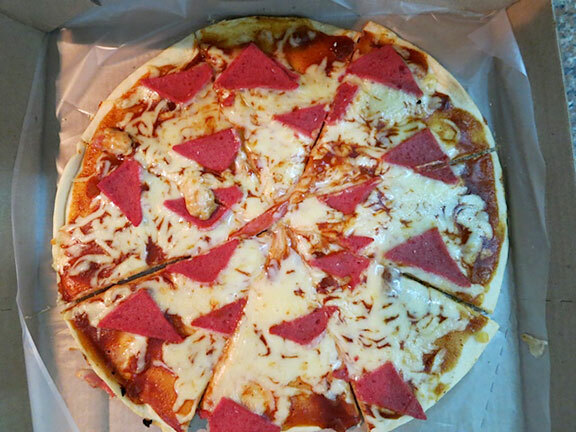 We were not fans of ham at that time, but for some reason, we loved the little ham slices that came with the pizza. My mom would actually laugh at us since sometimes, she could see the actual food coloring of the ham start to run when it would react with the heat of the cheese. We loved it so much that it we actually looked forward to our Green Valley trips more so for the 3M Pizza than the swimming. Fast forward to the present day, given the choices around, I have not had the chance to have 3M Pizza in a long time. I found the closest kiosk to be located at Pioneer Center Supermarket and I drove there last Saturday to buy a pizza to take home. I was delighted to see that the pizzas now come in 3 sizes and that there are seven flavors to choose from. Prices range from P95 to around P350. Of course, I bought my old time favorite Ham and Cheese: mega size at P210. I rushed home, took a bite and as always with anything nostalgic, a wave of memories came flooding through. Taste wise, everything was as I remember: the crispy dough, the runny sauce, and the salty, melted cheese. There were however, more slices of ham. This is actually a positive development. I can honestly say it was the best P210 that I have spent in a long time. Now if only 3M would open in Makati. YEAH 3M Pizza! 3M with a medium Icee is my favorite merienda after grocery shopping in Unimart. Thanks for the Pioneer Center info. Wooohoo! Thanks for stopping by Lou(natik)! HI Paulie, Ugly food our theme this month, refers to food that may not look too appetizing at first glance for a myriad of reasons, but taste great anyway. Thanks for stopping by.